From the man who gave us the mighty Pink Triangle Da Capo DAC in 1993 and the superb budget Cambridge Audio CD4SE Compact Disc player a couple of years later, came another great digital product in 2012. Audiolab’s 8200CD CD spinner is built in China by the International Audio Group, and was designed by British electronics whizz John Westlake. When launched, the player was one of just a handful that used the 32-bit American ESS Technology Sabre DAC, a device which came out in the latter part of the last decade, but which hasn’t surfaced in consumer products very often because it is too expensive. The Sabre is a sophisticated package, with 256 individual DACs per channel within the chip, to increase inherent conversion resolution, while also reducing static conversion errors. The conversion process results in the 512 DAC elements each operating at 84.672MHz, switching 3,840 times faster than the typical audio upper bandwidth of 22kHz – thus keeping digital noise well away from the human ear. As per Naim’s DAC, the Sabre operates either in integer oversampling or upsampling mode, depending on the input sample rate. All digital word lengths are extended to 32-bits for internal processing, and it will accept up to 24/96 in DAC mode. Like some other machines of its generation, the 8200CD features user-selectable digital filters which let the user tune the performance to preference, but there are more of them than most. They include Optimal Time Domain NOS (preferable for audio performance, slow in-band roll-off), Optimal Time Domain ZS (preferable for audio performance, no in-band rol- off), Optimal Frequency Domain (Measurement Mode filter), Standard Fast roll-off and Standard Slow roll-off. In addition to the standard supplied filters, the 8200CD allows user-upgradeable digital filters via USB download, for future-proofing. Along with the filtering, John Westlake took trouble over jitter reduction with a proprietary high performance discrete master clock. While the patented sample rate converter achieved 100% jitter attenuation within the digital domain, external ‘analogue domain’ induced artefacts via RF breakthrough and PSU coupling affect the DAC’s ultimate sonic performance. So Audiolab developed the Cascaded Asynchronous Time Domain Attenuator circuit to isolate the DAC substrate from the detrimental analogue domain of effects non-synchronous digital input data. Three identical cascaded stages were used, with each individual stage providing increased isolation. The 8200CD also has an asynchronous USB mode, where the DAC effectively clock-links the computer to its internal clock. 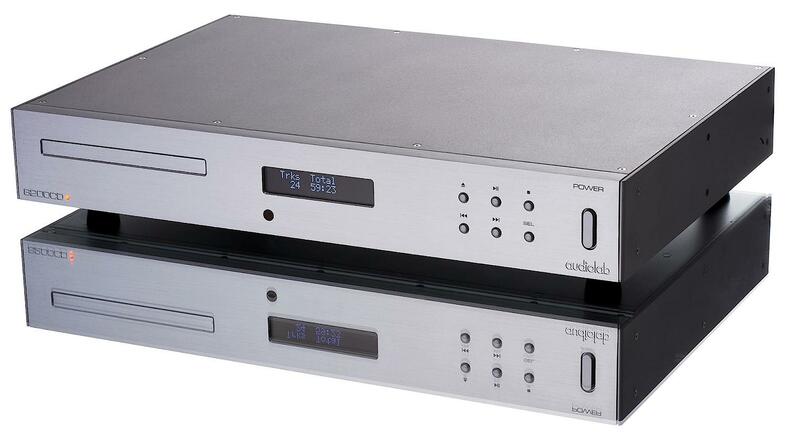 Careful attention was paid to the analogue output stage, with balanced analogue XLR outputs connected directly to a pair of proprietary Audiolab FET-based Class A stages buffers per channel. This gave a serious improvement in RF IMD rejection and no measurable RF rectification for a smoother sound. The unit is fully DC-coupled with no AC coupling capacitors. High tolerance polypropylene film/foil capacitors and special surface mount resistors are used in the signal path, and the player has thirty four regulated supplies, fourteen of which are ultra low noise discrete designs, combined with LC filtering for maximal interstage and RF isolation. A total of almost 250,00uF of bulk storage capacitance is used, and each section of the player was independently regulated. The result is a brilliant sounding £800 CD player, one as good as many at twice the price in some ways. It isn’t the sweetest, silkiest or most seductive silver disc spinner – others did and do better in conjuring up a euphonic tonality that flatters the discs that they play. However, what the Audiolab offers is a wonderfully expansive, cathedral-like soundstage with pin-point image location that was so solid it feels like it is set in stone. And it’s also able to make music in a way not normally associated with digital – it carries rhythms with utter faithfulness where normal CD players simply walk on by, preferring not to bother. In this sense, its sound is more Naim than Audiolab! Factor in breathtaking levels of detail resolution, with the ability to drill right down deep into the mix, and the Audiolab 8200CD is one of the greatest Compact Disc playing bargains of the decade so far. It is only a slight lack of deep bass extension and grip, allied to outright dynamics, that sets it behind machines costing many thousands of pounds more. It really is that good. “In my early twenties I designed one of my very first commercial DAC designs – the Pink Triangle DaCapo. It was a discrete DAC with 2 DAC elements per channel – 4 DAC elements for a Stereo DAC. The ESS DAC used in the Audiolab takes this many stages further with 1024 DAC elements for a Stereo DAC – that’s 512 DAC elements per channel. Both the DaCapo and ESS’s DACs produce a true voltage output node. This direct voltage output allows us to passively filter RF products (with no active electronics) which are produced from the digital to analogue conversion process before they can cause potential RF related intermodulation distortion products in the very sensitive front-end circuits of the analogue output stages. Simple Passive filtering can only attenuate these RF products to a reduced level – we then use JFETs in the front-end of our Class A analogue stages which offer significant immunity to RF-demodulation. RF leakage from the digital conversion process is one of the main reasons we believe conventional digital designs have a tendency to sound hard and bright. The use of the JFET front end degrades the SNR, but in our opinion the sonic benefits outweigh the degraded technically measurements – sound quality over performance figures. The filters are developed by us. Dominik (the other half the design team) is responsible mainly for the software side of the product, although he’s also been very supportive on the hardware side. The Optimal Spectrum and without question our favourite Optimal Transient type filters are direct descendants from our earlier R&D on FPGA based filter and modulator structures. The Optimal Spectrum filter is a ‘perfect’ digital filter at least from the frequency domain perspective – in that it achieves full attenuation by FS/2 (half the sampling frequency – as stipulated essential for ‘Aliasing free’ digital conversion by the basics of sampling theory). This differers from most digital filter designs, which only achieve -6dB at FS/2 to maximise the silicon area (i.e. reduce cost). While the Optimal Spectrum filter has almost ideal frequency domain performance, it introduces both pre and post ringing within the time-domain. The Optimal Transient types on the other hand can be considered the total opposite of the ‘Perfect Frequency Domain’ filter – trading poorer frequency domain performance for ‘optimal’ transient performance – with zero pre or post ringing. There are three versions of the Optimal Transient filters – and here’s where it gets both interesting and frustrating! All three versions achieve exactly the same digital data – the final 1s and 0s are mathematically identical but the calculations processed differently within the DAC. Think of it this way; 4+0 = 4, 0+4 = 4, 3+1 = 4, 1+3 = 4, 2+2 = 4; there are many ways to arrive at the same answer, but achieved via different mathematical calculations. These calculations are being processed on the DAC silicon itself, which introduces second order effects such as modulation of the internal PSU, Modulation of the die level conversion clock – and even Direct RF modulation across the silicon die itself. How much do these ‘second order effects’ affect the sound quality? Well, by listening to the first two permutations of the Optimal Transient filters (Optimal Transient and Optimal Transient XD) is the surprising answer. The Optimal Transient DD filter is a bit of wild card, as it takes into consideration the second order effects and applies corrective processing to nullify these effects – but once again its time domain and frequency domain characteristics are the same as the first two variants. Minimum Phase filter is a hybrid of the two main Optimal types, in that it has reasonable frequency domain performance with no pre-ringing in the time domain. The Fast and Slow filters are standard digital filter types – mainly included for comparison – personally I give them very little time. With over thirty power supply rails – close to 250,000uF of supply decoupling, a discrete ultra low short-term phase noise (ultra low jitter) clock oscillator, discrete fully balanced Class A output stages, fully balanced analogue preamplifier signal path, and with all active gain stages operating in Class A, and no less than 1,700 components, generally we are very proud of the design!